Although the RAF had not selected the Fo 141 Gnat for service in a front-line role, it did have a requirement for an unarmed, two-seat advanced trainer to replace the de Havilland Vampire T.Mk 11. Folland had already considered a training version of the Gnat as a private venture, and this was shown to be able to meet Air Ministry requirements including a 100 knot (185 kph) landing -speed. To make the Gnat a two-seater, it was necessary to remove the standard fixed-gun armament of two 30-mm ADEN cannon located in the cheek intake fairings, and relocate the fuel tanks, but no major structural alterations were required. The most significant change was a new wing, increased in area by 3.72sq.m and with additional fuel capacity, which reduced the fuel storage requirement in the fuselage, making room for additional equipment. The forward fuselage was increased slightly in length, the tail surfaces enlarged, and outboard ailerons and conventional inboard flaps replaced the inboard ailerons of the fighter version. Power was to be supplied by a 1919kg thrust Orpheus 100. Follands had already designed and built a new wing for a proposed development of the Gnat fighter for naval use, with improved low-speed performance. By adopting the simpler and more efficient construction of this wing, which was reduced in thickness from the eight per cent t/c ratio of the original Gnat, to a mean value of seven per cent, while retaining the symmetrical R.A.E. 102 (mod.) section, Follands were able to offer a larger area for the trainer to give the necessary reduction in landing speed without a major weight penalty. It had the additional facility of increased fuel capacity. A Ministry of Supply design study contract was awarded to Specification T.185D in the autumn of 1956 and a prototype contract was negotiated during 1957. Apart from performance, one of the main requirements was for the inclusion of an advanced level of equipment, comparable to that in operational aircraft under development although not then in service. This included new flight and navigational instrument presentation to OR.946, provision of engine anti-icing, centralised failure warning system, installation of liquid oxygen facilities and many other very advanced items. The OR.946 flight instrumentation occupied space on the instrument panel than in the earlier Gnat by the deletion of the gun-sight and bullet-proof windscreen framing. OR.946 concentrates all essential flight information on two display units occupying the entire centre of the panel. On the left is the roller-blind F.4 attitude indicator, which takes the place of the normal artificial horizon, and provides a non-toppling reference in all flight conditions, while on the right is the Mk.1 display unit for TACAN and other navigational equipment. Additional space for the "black boxes" making up the Gnat T.l's sophisticated equipment, including TACAN, ILS and the Air Data Computer, was found by enlarging the spine fairing of the original fighter behind the cockpit canopy. The canopy itself, as well as the windscreen, was completely new, the former being of the aft-hinged clamshell type, blown from a single piece of Perspex. To protect the rear occupant in case of canopy jettison, the Gnat trainer has an additional internal windscreen over the duplicated instrument panel. An ejection escape system was developed specially for the trainer by Folland, using two of the company's own lightweight seats. Work on these was started by Folland in 1953, using a SAAB-type seat layout as the original basis, but development had since continued entirely independently. The Mk. 4GT1 (front) and 4GT2 (rear) ejection-seats in the Gnat have 80 ft/sec (24.4 m/sec) telescopic guns for adequate fin clearance at all airspeeds, and are cleared for use down to runway level at speeds of 90-650 knots (106-1204 km/h). They are used in conjunction with GQ Mk-35 back-type parachutes, plus Type X personal survival packs in the seat pans, and have 6 ft (1.82 m) diameter drogues for man stabilisation if ejection takes place above 10,000 ft (3050 m). An extractor 'chute on the seat helps immediate separation, with a drogue sock pulled off by a static line as the seat leaves the aircraft. After initiation by face-blind or seat-pan handle, operation of the seats is fully automatic. Engine installation was not changed from the original Gnat except that a slightly de-rated Bristol Siddeley Orpheus was adopted in the interests of improved fuel economy and longer overhaul times. Secondary modifications provided intake anti-icing from hot air tapped from the engine compressor through to the entry guide vanes and bullet, and drive for a larger electric generator. In its standard RAF form, the Gnat trainer was powered by an Orpheus 101 developing 4230 lb (1920 kg) thrust for take-off, but it is offered in addition with the higher-powered (4,720 lb (2135 kg) Orpheus 501 if extra altitude performance is required. A Gnat trainer (XM698) has also flown with the fighter-engine, which is the Orpheus 701, with a similar thrust to the 500 series. 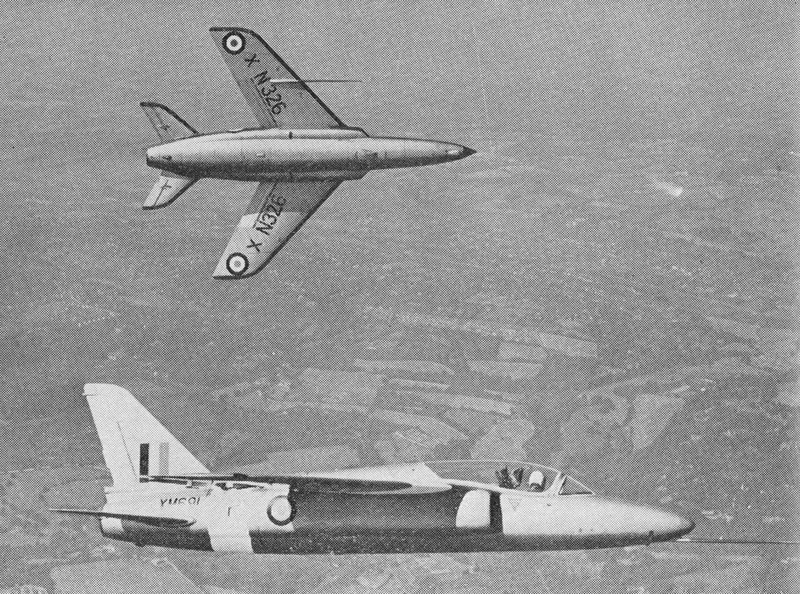 Following the finalisation of the design, a contract for fourteen development aircraft to spec- T.185P was placed in March, 1958, and the first prototype Fo.144 Gnat trainer made its initial flight in the hands of Sqdn. Ldr. E. A. Termant on August 31, 1959. The first eight of these aircraft were mainly employed for per-formance testing and development of the various systems, including improved longitudinal control. After successful evaluation by the various official bodies concerned, a production order was placed in July 1960 for thirty aircraft for use as advanced trainers, and an additional twenty were ordered a year later. A further order for forty-one followed in March, 1962. These were being turned out at the requested rate of four per month. The Gnat trainer was then being offered on the overseas sales market. Hydraulic power is used as the primary means of operating ailerons and the all-flying tailplane, with manual reversion in case of failure of the hydraulic system. Compared with the original Gnat, which had combined inboard ailerons and flaps, the trainer has a conventional flap and outboard aileron arrangement. The ailerons have automatic control stops which just about halve their range of movement to eight per cent at speeds above 150 knots IAS (278 km/h) to limit the rate of roll and prevent inertia coupling. Effective longitudinal control results from the hydraulically-powered flying-tailplane, which like the ailerons has spring-feel. A “Q” gearing mechanism reduces the amount of tailplane movement for a given stick displacement as speed increases, which improves handling at high indicated airspeeds, but the stick force per g is still very light above 400 knots (741 km/h). Tailplane trimming is via an electric actuator and thumb-switch on the control column. In the event of hydraulic failure, the rear portion of the tailplane may be unlocked to act as elevators, with tailplane trimming still available from a stand-by electric motor in the Hobson unit. Stick forces in manual are apparently not heavy, but because of the small size of the elevators, their effectiveness is only about one-fifth of that of the tailplane. Speed is then restricted to 400 knots (741 kph) or M0.85. The Orpheus 101 was up-rated to 4,400 lb (1995 kg.) thrust to improve the high-altitude performance. With its simple and rugged structure designed for a minimum fatigue life of 5,000 hours and characterised by the absence of complicated castings and forgings, the Gnat is not difficult to build or maintain. It became clear, however, that no production order would be placed while Folland remained outside the major manufacturing groupings which the government favoured; thus the company was taken over by Hawker Siddeley Aviation, becoming its Hamble Division. Contracts for 30, 20 and 41 aircraft were awarded in February 1960, July 1961 and March 1962 respectively. The last production Gnat T.Mk 1 flew on 9 April 1965 and was delivered to the RAF on 14 May, in the all-red scheme of the Red Arrows team. The Central Flying School, then at Little Rissington, first introduced the type in February 1962 but the major operator was No. 4 Flying Training School at Valley, which took its first aircraft on strength in November 1962 and which, in 1964, introduced the Gnat to the formation aerobatic scene, operating five all-yellow Gnats known as the Yellowjacks. The team reformed as the Red Arrows in 1965, under the control of the Central Flying School, and its Gnats were withdrawn finally at the end of the 1979 display season, to be replaced in 1980 by the British Aerospace Hawk T.Mk 1. No. 4 FTS retired its Gnats on 24 November 1978. Including licence built models, India received 238 plus 79 similar Ajeets. Max level speed: 610 kts EAS (1130 km/h) at sea level (Mach 0.93). Climb to 26,000 ft. (8 000 m), 4 min. 40 sec. Climb to 40,000 ft (12,000 m), 7 min 30 sec. Range with external fuel, 1,000 nm (1 850 km). Armament: 2 x 30mm Aden cannon.